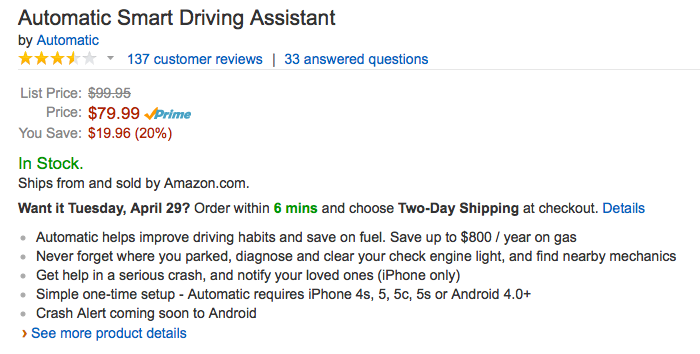 Amazon offers the Automatic Smart Driving Assistant for $79.99 with free shipping, which is 20% below retail and the first price drop we have ever seen for this appcessory. As a further pricing comparison, both Best Buy and Apple are charging full list ($99.99) for it. Automatic plugs into your vehicle’s (1996 or newer) diagnostic port and transmits valuable information to your iPhone or Android smartphone that can help improve driving habits and save on fuel. Furthermore, it can remind you where you parked, diagnose and clear your check engine light, and find nearby mechanic. Crash Alert (iPhone only right now) can help you get help and notify family members if you get into a serious accident. 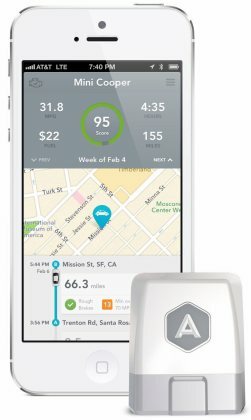 While Automatic can’t make you be a better driver, it can certainly help you along the way if you’re willing to take a little coaching. The accessory gives you a subtle beep when you break or accelerate too fast or break 70 mph. Take your weekly score into account, notice what behaviors you repeat, and most importantly aim for fewer beeps and you’re bound to improve… if you’re willing. Rated 3.6 stars from Amazon reviewers and 3.5 out of 5 from Apple reviewers.